Thanks to his books FRUITS and FRESH FRUITS, Shoichi Aoki’s street magazine Fruits is now better known abroad than in Japan. The magazine with an almost cult-like following in Japan has been documenting Tokyo street fashion since 1996. To record this creative explosion of fashion, Aoki started up Fruits, focusing almost exclusively on these wild Harajuku trends. Fruits is not your average fashion magazine. It is printed on relatively cheap paper without all the expensive advertising of the mainstream fashion magazines. There are no fabulously looking models which you will never ever meet in real life. Instead there are real people, usually staring zombie-like straight into the camera. 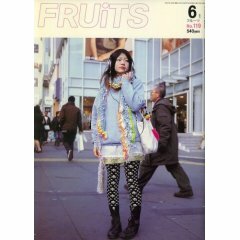 Fruits is published by Street Henshushitsu, which also publishes STREET and TUNE.